A volume phase holographic grating (also known as a VPH grating or VPHG) operates on the principle of interference, diffracting light due to modulation of the index of refraction within the grating material. 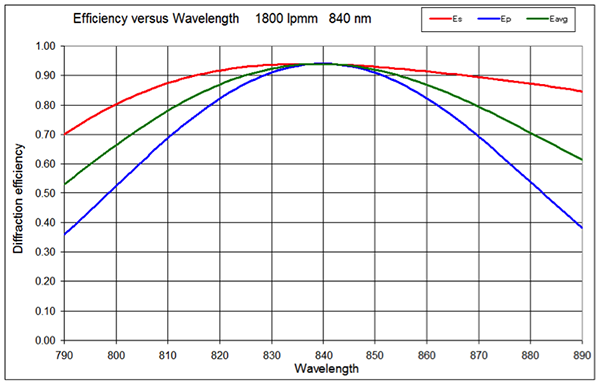 Light is transmitted and dispersed by wavelength through a range of angles, dependent on the grating material properties and frequency of modulation (i.e., the spatial frequency in lines per millimeter). 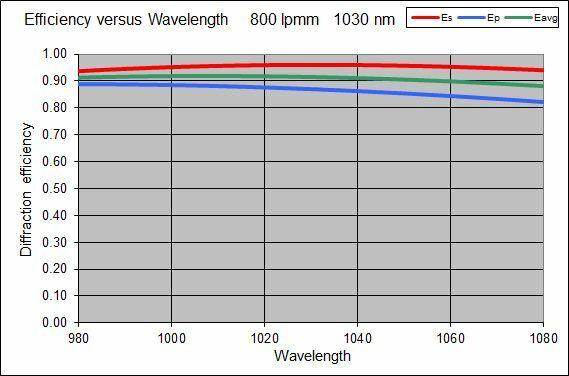 Wasatch Photonics VPH gratings operate in transmission, using dichromated gelatin (DCG) as the active grating material (thickness “t”). Each grating produced is an original, with consistent performance from one grating to the next – there’s no “master grating” to wear out. Our proprietary processes minimize stress, resulting in low wavefront distortion, and our stringent adherence to quality ensures minimal scatter. We offer three primary design technologies for our transmission gratings: standard/enhanced gratings, Dickson gratings, and HD gratings, each with different benefits in bandwidth, efficiency, and polarization. 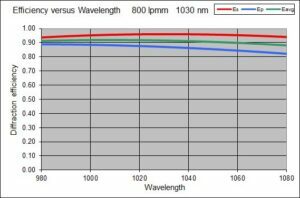 By varying the grating material thickness and index modulation (the degree of contrast between high & low index), we can enhance a grating to maximize the diffraction efficiency of s-polarized light, p-polarized light, or average polarization. For laser pulse compressor and stretcher applications, we can design gratings which operate at very high efficiency over a broad bandwidth range at a single polarization, with >94% measured efficiency across the full operating band. Many applications, such as spectroscopy, aim to disperse light over a specific bandwidth without regard to polarization, and are better suited to a “Dickson grating” design, named in honor of one of our founders, Lee Dickson. This design uses a thicker layer of DCG in which the index modulation is chosen so as to optimize the efficiency of both s- and p-polarizations at a specific wavelength and the adjacent 20-60 nm. This design technology supports angle tuning of the center wavelength for astronomy, and can be fabricated in large dimensions. As the original patent holders on the Dickson grating, we understand better than anyone how to design and consistently manufacture this design to high quality standards. Our Dickson gratings can be found worldwide, from spectrographs in leading astronomical observatories to OCT diagnostic instruments in your ophthalmologist’s office, telecommunications networks, and the handheld Raman scanners used by first responders. As can be seen from the plot above, even Dickson gratings lose efficiency in one polarization as you extend to wider bandwidths. This can compromise the quality of data obtained in both spectroscopy and OCT applications, and limits the usable bandwidth. 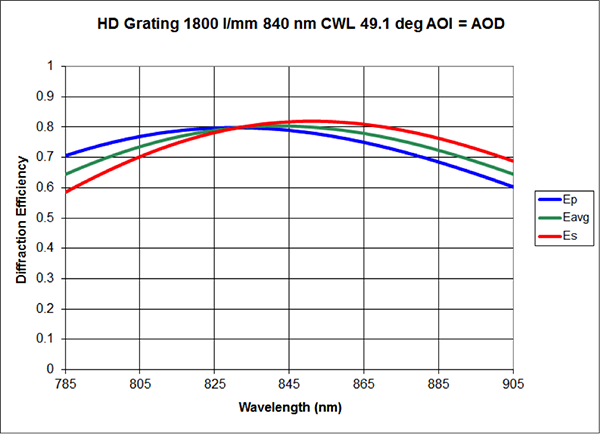 To circumvent this limitation, we developed and patented the HD (high dispersion) grating, which offers significantly lower polarization dependency over a very broad range of bandwidths — on the order of 200+ nm. 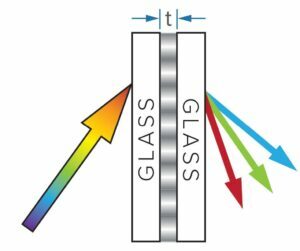 The availability of a broadband grating for which s- and p-polarized light is diffracted very efficiency has benefits in many spectroscopic applications, Raman spectroscopy and spectral domain OCT (SD-OCT) in particular. Raman spectroscopy is an inherently photon-starved application, in which even small differences in efficiency can determine whether a characteristic peak is seen. 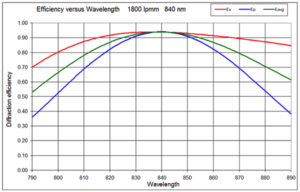 Use of gratings with high efficiency over a broad bandwidth maximizes collection of light for better instrument efficiency at the spectral extremes. This is key to library matching and detection of trace substances. In SD-OCT, the bandwidth of the light used plays a large role in determining the imaging depth of the system. SD-OCT is based on Fourier-transform of the scattered light at various depths, and thus uniform contribution from each wavelength component is key to the quality of the processed data. By delivering high efficiency at the extremes of a broad bandwidth range, our HD gratings enable clearer images to be obtained at greater depths. Wasatch Photonics is the only supplier of VPH gratings able to provide the broadband, high efficiency HD gratings, making us a key supplier to the Raman spectroscopy and OCT markets in both research and industry. Once the ideal design technology has been chosen for a given application, our R&D team can work with you to further optimize the parameters of your transmission grating for best performance. Since each grating is written as an original rather than being replicated from a costly master, we are able to easily fine-tune the performance of each grating design project for bespoke research or OEM applications. Experience with a wide variety of projects over 2 decades has expanded our capabilities in almost every parameter, as described below. 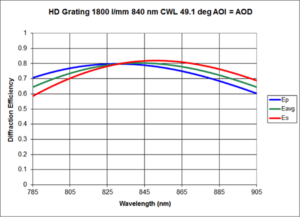 We routinely provide gratings operating at wavelengths ranging from 350 nm to 2500 nm, and will look at designs outside this range upon request. Our high efficiency gratings may be optimized for narrow wavebands, or over bandwidths spanning hundreds of nanometers. Gratings may be optimized for a single polarization (s- or p-), or designed for best performance over a given bandwidth of unpolarized light. Polarization may even be optimized differently for specific wavelengths in unique circumstances. Exact grating dispersion or spatial frequency may be specified, up to 4000 lines/mm. Our standard specification for spatial frequency accuracy is ± 0.5-1.0 lines/mm, with tighter tolerances available upon request. VPH gratings are typically designed to work at the Bragg angle, with equal angle of incidence (AOI) and angle of diffraction (AOD). The AOI used influences other performance parameters, and thus limitations on the desired angle range should be discussed with our design team. Non-symmetrical gratings can also be fabricated as needed (AOI≠AOD). While many of our standard gratings are available as 25 or 50 mm diameter, we also provide square and rectangular gratings for pulse compression, spectroscopy, and astronomy. VPH transmission gratings can be produced in volume as small as 10×10 mm, and smaller for special projects. At the opposite extreme, we can image large format gratings up to 300 mm in dimension for astronomy, large imaging arrays, and hyperspectral spectrographs (larger upon request). We work with a wide variety of substrate types, including BK7, B270, fused silica, and others. We source substrates of only the highest quality from a list of preferred suppliers selected for optical quality, wavefront retention, and ability to provide low-defect material for minimal scatter. Specific glass parameters may be called out as needed, such as flatness, homogeneity, low bubble inclusion, and criteria on striae. Substrates may vary from 1 mm (to minimize material induced dispersion and self phase modulation in ultrafast laser applications) to up to 25 mm thick to provide the rigidity needed for large format astronomy gratings. Custom substrate geometries are also available upon request, such as grisms (a grating-prism hybrid). As you look to integrate a VPH transmission grating into your optical design or instrument, our R&D team is available to discuss your specific needs. We understand the performance tradeoffs to be considered for a wide range of applications, from pulse compression, spectroscopy, and imaging to OCT, lidar, and telecommunications. With a wide range of standard and patented design technologies and an inherently flexible manufacturing process, we give you control over your design. Our dedication to the highest quality and efficiency in each grating guarantees performance. Contact us to discuss your needs today.